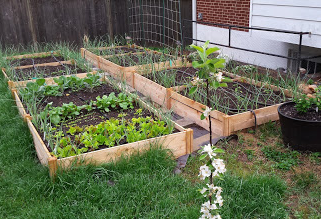 If I’m lucky though things will warm up next weekend and I’ll be able to plant almost everything the first weekend in May (not this weekend, but next weekend). I think the tomatoes, marigolds, impatiens, zinnias, ground cherry and probably the peppers will go out next weekend. The eggplants and the basil are going to have to wait until the week after. I can still plant a lot of the seeds though, I’m looking forward to planting the beans, squash, corn and cucumbers! They’ve got nice big seeds so they’re easy to plant generally.